Always stoked to have the opportunity to drag out this shot of Deputy Dudek. Photo by Dry Rock. All Hallows Cross, race #6 in the MABRAcross series, is this Saturday in Hughesville, Maryland. All Hallows, presented by Pax Velo, debuted last year with a slopfest that favored the power guys and gals in the region. With long straights and not much elevation, the rain was the only thing that kept the race pace in check for 2009. If it stays dry the remainder of this week, the course is sure to set up much faster. For this course preview we welcome back MABRAcross technical advisor and Squadra Coppi chief Ken Woodrow. The video is a mish mash of the promoters riding around the course and last year’s rainy masters 3/4 race. Thanks for watching and we will see you Saturday. 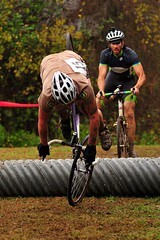 We should all keep in mind that lots of tight turns is not a prerequisite for a cross course. For example, look at this video from Beacon. Super cool course without a great number of tight little turns. DID THE ORGANIZORS ASKS IF THEY CAN HAVE A TURNS IN A SAND PITHS?!!!! Actually, I believe the narrator of the video, who is a member of the CX Tech Comm, suggested it. Last year the horse rings were so firm that after a single race, the straight-line route through was essentially pavement. The sand is still so firm, frankly, that it was actually difficult to get the stakes in: apparently there’s a gravel substrate not that far down. It’s going to be fast. Can you wash out if you’re not careful? Sure. Turns are just as much a part of CX as any other sort of racing and the beauty of it is that each course is not only different, but can be made different from year to year. Best wishes.